Without regular care, the plaque on your pet’s teeth will build up, leading to tartar and gingivitis, which can develop into periodontal disease. Studies have shown that by the age of 3, 80% of cats and dogs have some form of periodontal disease. If it’s not treated or managed, this disease can cause bleeding, make eating difficult, and lead to more serious health and dental hygiene problems. If you’ve ever had a loose tooth, you’ll know that they’re painful. The progression of periodontal disease can cause loose teeth and even tooth loss! Loose teeth make activities like eating and chewing difficult for your beloved pet, but with regular care, you can make sure those teeth stay firmly in place. Tying into the above reason, caring for your pet’s teeth can prevent discomfort and pain. Periodontal disease and loose teeth are painful, and our pets are remarkably good at hiding when they are in pain. However, that doesn’t mean they aren’t experiencing any. Make sure that your pet isn’t having difficulty eating or chewing because of poor dental health. Gingivitis leads to periodontal disease, and periodontal disease can lead to other health problems outside of the mouth. The bacteria that develops around your pet’s teeth can enter their blood stream and cause more serious medical conditions, including heart, kidney, or liver disease, or diabetes. On a more superficial level, providing regular care for your pet’s teeth can prevent bad breath. If your pet’s breath is so bad it sends you running in the other direction, a good cleaning may be in order. 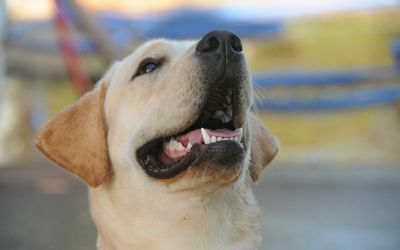 A daily dental routine can also keep your pet’s pearly whites looking just like that – white. Give your pet a whole new smile with regular brushing. Although yearly cleanings will cost you some money now, they could save you big bucks down the road. By keeping your pet’s teeth clean and free of disease, you could be saving yourself from expensive medical procedures in the future, including tooth removal, surgery, or the cost of dealing with other health conditions that could arise from periodontal disease. All of these are great reasons to celebrate pet dental health month, but there’s just one more – because you love your pet! Brushing your pet’s teeth is a great and easy way to keep them healthy and happy and show that you care about their well-being. Have we convinced you yet to celebrate National Pet Dental Health Month? Contact us today about getting started on the path to good dental hygiene with a professional cleaning!